Washington, D.C., simply referred to as D.C., is the capital of the United States and is regarded as one of the most significant cities in the country – after all, it has the White House and is the seat of all three branches of the American government. While the congressmen and bureaucrats keep it rich and sophisticated, students from all over the world make the city vibrant and affordable, and of course, there are tourists who make D.C. eclectic and happening. Home to an unparalleled concentration of museums, national monuments, and memorials, D.C. streets are also lined with shopping, wining-and-dining, and nightlife. National Mall, a two-mile gorgeous stretch comprising many of D.C.’s landmarks and the highly-revered Smithsonian Museums, is where most tourists flock to. A distinctive mix of people from all around the world and all walks of life call the city home and this is what adds to the multi-cultural vibe of one of the most powerful metropolitans in the world. 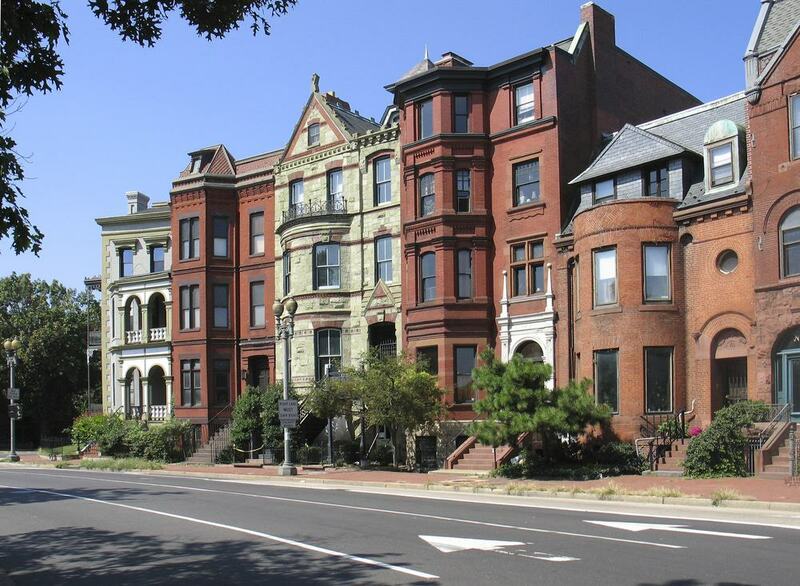 Let us take a look at some of the most popular neighborhoods in the city to help you plan where to stay in Washington D.C. during your visit. Arguably, the oldest part of the city, Georgetown is known for its cobbled streets lined with structures that date as far back as 1751 and shopping and dining avenues that give new-age a whole new meaning. 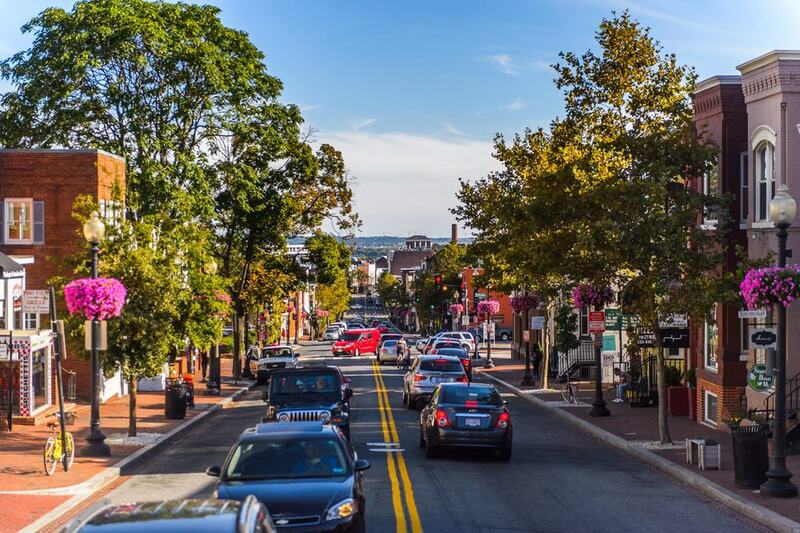 Perched above a magnificent waterfront harbor of Potomac River, the neighborhood is home to the illustrious Georgetown University which gives the area its lively collegiate vibe. Tall, old trees are dotted around the pathways while quaint 18th and 19th century architecture are found scattered around the lanes. 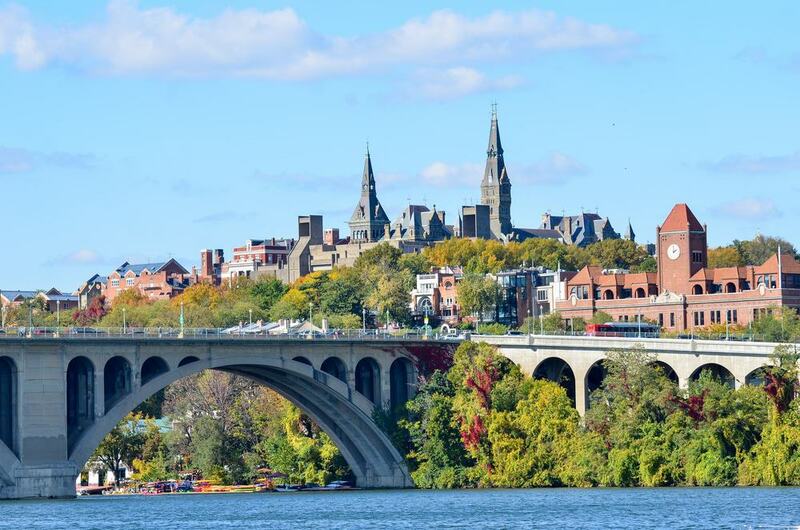 Catering to a mixture of aristocratic socialites and cheerful college students, Georgetown is home to several historic landmarks, including the Exorcist Steps and Dumbarton Oaks. Other Highlights: Chesapeake and Ohio Canal, Blues Alley, Tudor Place, Book Hill, Washington Harbor, Oak Hill Cemetery, and Old Stone House. The Georgetown House Boutique Inn – A few hundred meters from the magnificent Georgetown Waterfront, this humble hotel offers well-appointed guestrooms with air-conditioning, flat-screen TV with satellite channels, seating area (in selected rooms), and ensuite bathroom with free toiletries. The property also features a shared kitchen and free Wi-Fi. Suitable for all kinds of travelers. Georgetown Inn – A short walk from Georgetown Waterfront Park, Georgetown Inn features fully-furnished guestrooms with comfy double bed, air-conditioning, flat-screen TV, ironing facilities, free Wi-Fi, and ensuite bathroom. Additional facilities at the hotel include access to a 24-hour cardio room, a fitness club, private parking, and a 24-hour business center. Great for all kinds of travelers. Georgetown Suites – Set in the heart of the historic neighborhood, the property offers luxurious, well-appointed suites with extra-large double beds, air-conditioning, flat-screen TV with cable channels, safety deposit box, and ensuite bathroom with bath/shower. A complimentary continental breakfast is served daily. Suitable for solo travelers and couples. One of the trendiest neighborhoods in the city, Dupont Circle is characterized by its many art galleries, exclusive shops, cafes, bars, and of course, the namesake traffic circle. Originally known as Pacific Circle, the circle features a large marble fountain that dates back to 1921. 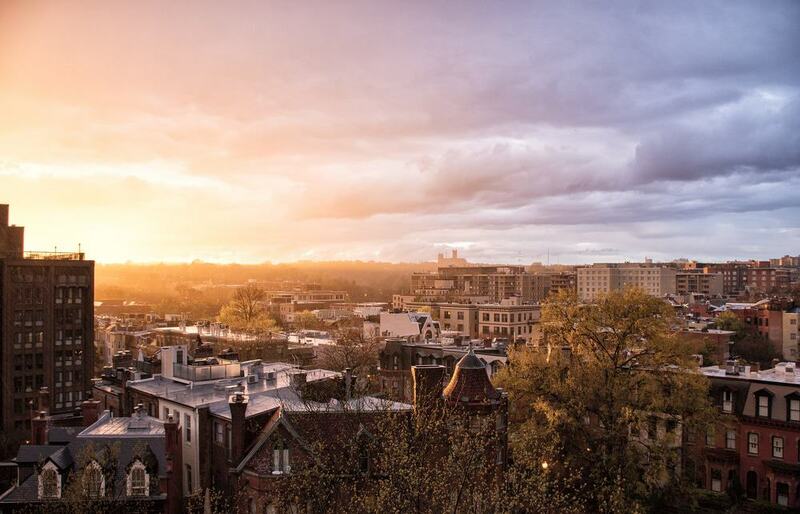 An extremely favorable place to stay among the young and the wealthy, Dupont Circle has a flourishing LGBT community. Home to some of the finest museums and historic homes in D.C., the neighborhood is arguably the heart of the city’s nightlife scene. Notable structures in the area include Woodrow Wilson House, The Cathedral of Saint Matthew the Apostle, and Brewmaster’s Castle. For a good laugh, find your way to DC Improv, reportedly the most famous comedy club in the city. Good for: All kinds of travelers, especially the young and wealthy. Other Highlights: The Phillips Collection, Second Story Books (a must-visit for bibliophiles), Embassy Row, Sunday Farmer’s Market, The Spanish Steps, National Geographic Museum, The Mansion on O & O Street Museum, and Anderson House. The Dupont Circle Hotel – A few steps away from the metro station, the Dupont Circle Hotel offers comfortable guestrooms with extra-large double beds, safety deposit box, flat-screen TV with satellite channels, seating area, iPod dock, and ensuite bathroom with free toiletries. Guests can utilize the business center or relax outdoors by the fountain. Great for all kinds of travelers. The St. Gregory Hotel – Featuring a 24-hour front desk and a fitness center, the comfortable guestrooms and suites come with extra-large double bed, flat-screen TV with pay-per-view channels, ironing facilities, dining area, and ensuite bathroom with free toiletries. Suitable for all kinds of travelers. The Embassy Row Hotel – Tucked between charming row homes and historic embassies, this wonderfully-decorated hotel offers cozy beds, air-conditioning, free Wi-Fi, flat-screen TV with cable channels, seating area, iPod dock, closet, and ensuite bathroom. The rooftop terrace offers cabanas, a shaded lounge area, and an outdoor pool. Great for all kinds of travelers. 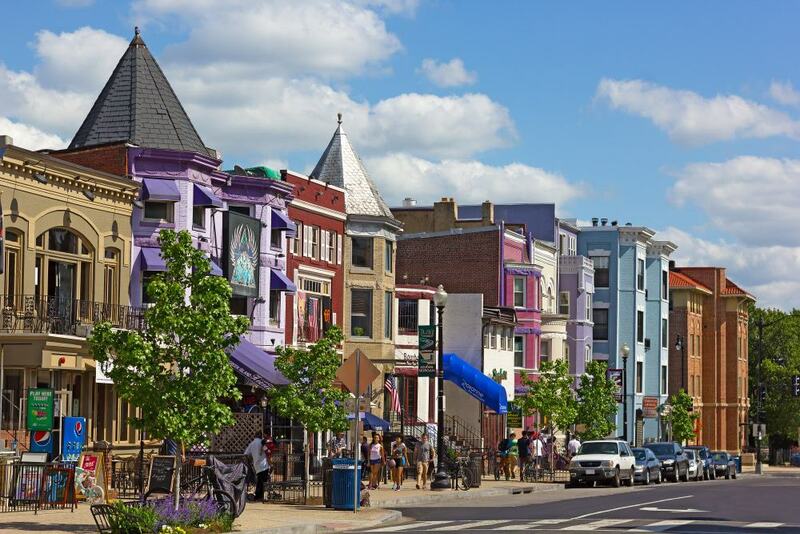 The charming, historic neighborhood of Adams Morgan, just west of Columbia Heights, is popular among visitors for its cultural vibrancy, outdoor markets, international diners, and eccentric shopping. This neighborhood is also popular for the highest concentration of bars and nightclubs than anywhere else in D.C. Named after the all-white John Quincy Adams Elementary School and the all-black Thomas P. Morgan Elementary School, Adams Morgan’s primary attraction is the two-hour self-guided heritage walk around the neighborhood that takes you through almost all the important places in the area, including luxurious embassies, Lanier Heights, and Victorian row houses of the 18th Street. Other Highlights: Madam’s Organ blues bar, Kalorama Recreation Center, and Meridian Hill Park. The LINE Hotel DC – Featuring 60-foot vaulted ceilings, large copper entrance doors, and beautiful architectural design, this neoclassical church transformed into a hotel features elegant accommodation with free Wi-Fi, a curated micro-library, custom furnishings, an old-school radio, and handmade bath products. Multiple dining and drinking options are available on-site along with a live broadcast radio station and stunning views of the city. Perfect for all kinds of luxury travelers. American Guest House – A 10 minutes’ walk from the nearest metro station, American Guest House offers well-appointed guestrooms with features such as comfortable double beds, air-conditioning, free Wi-Fi, ironing facilities, and ensuite bathroom with free toiletries. A complimentary breakfast is served daily. Suitable for solo travelers and couples. 1BR in DC Hotspot Adams Morgan – Set in the heart of this bustling neighborhood, the property features fully-furnished one-bedroom apartments with plenty of facilities such as air-conditioning, washing machine, tumble dryer, wardrobe/closet, private entrance, sofa, fireplace, safe, and an ensuite bathroom. Guests can also enjoy the common kitchen and lounge area. Suitable for solo travelers, couples, and small families. Logan Circle, primarily a residential area and a historic district, was formerly known as Iowa Circle and was renamed in 1930 to commemorate John A. Logan, a Union Army General, Illinois state senator, and Commander of the Grand Army of the Republic. A virtually unchanged neighborhood, the streets of the neighborhood are dotted with Late Victorian and Richardsonian architecture that were all built between 1875 and 1900. The most significant highlight of the neighborhood, aside from its beautiful houses, is the Logan Circle Park, the former site of Camp Barker during the Civil War and the present location of the 25-foot-tall John A. Logan equestrian statue. Other Highlights: Mt. Olivet Lutheran Church, Studio Theatre (winner of 60 Helen Hayes Awards), Gallery Plan B, Logan Circle Heritage Trail, and Mary McLeod Bethune Council House. The Westin Washington, D.C. City Center – An elegant hotel property, the hotel features stylish guestrooms with modern amenities such as an extra-large double bed, flat-screen TV, safety deposit box, refrigerator, and ensuite bathroom with free toiletries. Guests can also enjoy the common lounge, on-site dining, and a state-of-the-art fitness center. Suitable for all kinds of travelers, including big groups of up to 5 members. Washington Plaza Hotel – Just a short kilometer from the White House, Washington Plaza Hotel offers luxurious guestrooms with latest amenities such as tea/coffee maker, ironing facilities, laptop safe, wake-up service, flat-screen TV with cable channels, and ensuite bathroom. Extra facilities at the hotel include a seasonal outdoor pool, a restaurant and lounge, on-site parking, and a fitness center. Great for all kinds of travelers. Kimpton Donovan Hotel – Featuring world-class amenities and services, this chic eco-friendly hotel comes with trendy guestrooms, on-site dining, a rooftop pool with panoramic views of the city, 24-hour concierge services, a bar menu, a shared lounge, private parking, and special facilities for your pets. Suitable for solo travelers, couples, and small families. Primarily consisting of private residences, the neighborhood of Foggy Bottom is among the oldest areas in the city and is home to the prestigious George Washington University. 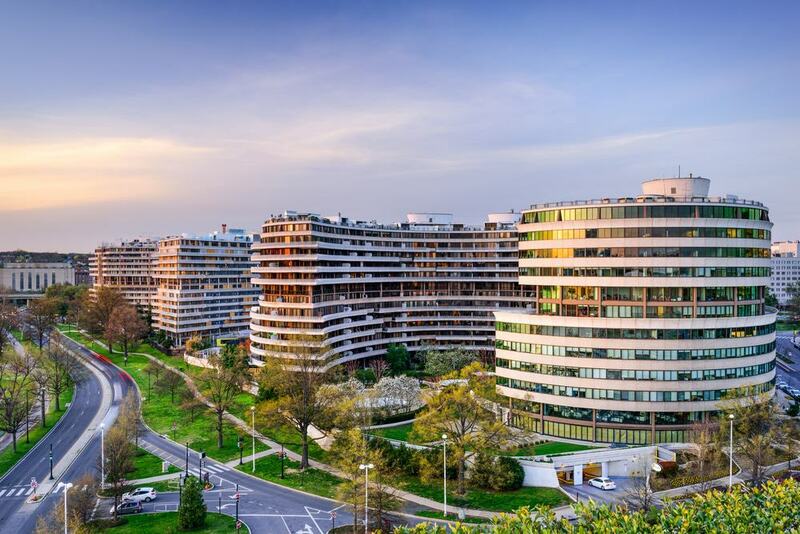 Located west of the White House, the neighborhood houses many of D.C.’s famous landmarks, including Kennedy Center for the Performing Arts, the abominable Watergate Complex, and George Washington University Museum. World Health Organization, World Bank, and the American Red Cross have established offices here. A short walk towards Pennsylvania Avenue brings you to the most iconic edifice in the city, the White House. Other Highlights: Simon Bolivar Memorial, State Department’s Diplomatic Reception Rooms, Thompson Boat Center, Textile Museum, Lincoln Memorial, and Rock Creek Park. State Plaza Hotel – Located a few hundred meters from the highly-distinguished George Washington University, State Plaza Hotel offers fully-furnished guestrooms with facilities such as comfortable rooms, tea/coffee maker, dressing room, kitchen and kitchenware, flat-screen TV with satellite channels, and ensuite bathroom with a bath. Guests can also enjoy the on-site fitness center and dining facility. Great for all kinds of travelers. ARC The Hotel, Washington, DC – A short walking distance from John F. Kennedy Center, this luxurious hotel boasts spacious guestrooms with extra-large double bed, air-conditioning, flat-screen TV with CD player, coffee maker, and private bathroom. Additional facilities at the hotel include on-site dining, underground valet parking, and a fitness center. Suitable for all kinds of travelers. The Watergate Hotel Georgetown – This world-class hotel features luxurious, state-of-the-art guestrooms that overlook the river and are equipped with flat-screen TV, a work desk, and ensuite bathroom. Guests can also enjoy the fully-equipped fitness center, a rooftop bar, a fabulous spa, an indoor pool, and on-site dining. Perfect for all kinds of travelers. A sub-section of the Upper Northwest, Woodley Park, along with its surrounding area, is considered among the country’s most privileged and affluent neighborhoods. Woodley Park, in particular, is known for its strip of elite restaurants, high-end bars, gigantic green spaces, and wealthy residences. Home to many iconic personalities including former President Grover Cleveland and WWII Secretary of War Henry Stimson, the neighborhood’s most prominent attractions are the Smithsonian’s National Zoo (don’t miss the pandas) and the National Cathedral. A sophisticated alternative to the crazy streets of its adjoining neighbor, Adams Morgan, Woodley Park ‘s two-floor vintage shopper’s haven, Via Gypset is a must-stop for all shopaholics. Other Highlights: Tregaron Conservancy, St. Thomas Apostle Catholic Church, Marilyn Monroe Mural, Rock Creek Park, and Uptown Theater. Kalorama Guest House – A gentle stroll away from Smithsonian National Zoological Park, Kalorama Guest House offers comfortable guestrooms with air-conditioning, free Wi-Fi, tumble dryer, cable TV, and ensuite bathroom. A complimentary breakfast is provided daily. Suitable for solo travelers and couples. Washington Marriott Wardman Park – Featuring a fully-equipped fitness center, an on-site restaurant, and a bar, this lavish hotel offers extra-large double beds, flat-screen TV with cable channels, ironing facilities, iPod dock, wardrobe/closet, and ensuite bathroom with free toiletries. An optional breakfast is available daily. Great for all kinds of travelers. Omni Shoreham Hotel – Nestled amidst the beautiful green space of Rock Creek Park, Omni Shoreham Hotel offers beautiful guestrooms with extra-large double bed, flat-screen TV with satellite channels, laptop safe, iPod dock, and ensuite bathroom. Superb facilities such as a dry sauna, an outdoor pool, in-room spa services, and on-site dining facilities are also available. Suitable for all kinds of travelers. At the center of all attractions and activities rests the neighborhood of Downtown DC, offering a wide range of historical, cultural and entertainment experiences as well as an opportunity to appreciate some of the most famous landmarks of Washington D.C. Bordered by the most famous address of the city and easily the country, 1600 Pennsylvania Avenue, the neighborhood is a blossoming center for business, wining-and-dining, shopping, culture, and nightlife. Some of the most prominent attractions in the area, apart from the White House, are National Gallery of Art, CityCenterDC (an absolute paradise for shoppers), and DAR Constitution Hall. While here, you absolutely can’t miss a stroll around the National Mall – this is where the best of the D.C. museums can be found. Other Highlights: National Museum of Women in the Arts, POV Rooftop Lounge and Terrace (for a cocktail with a view of the White House), Renwick Gallery of the Smithsonian American Art Museum, and National Geographic Museum. Hampton Inn – Washington DC/White House – 5 minutes’ walk from the White House, this opulent hotel features plush guestrooms with state-of-the-art facilities, an indoor pool, free Wi-Fi, a fully-equipped fitness center, a business center, private parking, and an exceptional complimentary breakfast. Great for all kinds of travelers. One Washington Circle-A Modus Hotel – Next to the Washington Circle in the heart of Downtown DC, this elite hotel offers well-appointed suites with facilities such as an extra-large double bed, air-conditioning, iPod dock, ironing facilities, flat-screen TV with cable channels, and ensuite bathroom with free toiletries. The property also features on-site dining, gymnasium, and an outdoor pool. Suitable for all kinds of travelers. Hotel Lombardy – Situated on the world-renowned Pennsylvania Avenue, Hotel Lombardy offers exceptional guestrooms with a flat-screen TV, air-conditioning, tea/coffee maker, safety deposit box, minibar, ironing facilities, seating area, and en suite bathroom with free toiletries. Guests can enjoy gourmet dining, a bar and lounge, a café, in-room spa services, and a fully-serviced gym. Perfect for all kinds of luxury travelers. If you want to gawk at the best bunch of American politicos, Capitol Hill, also known as “the Hill,” is the place to be. 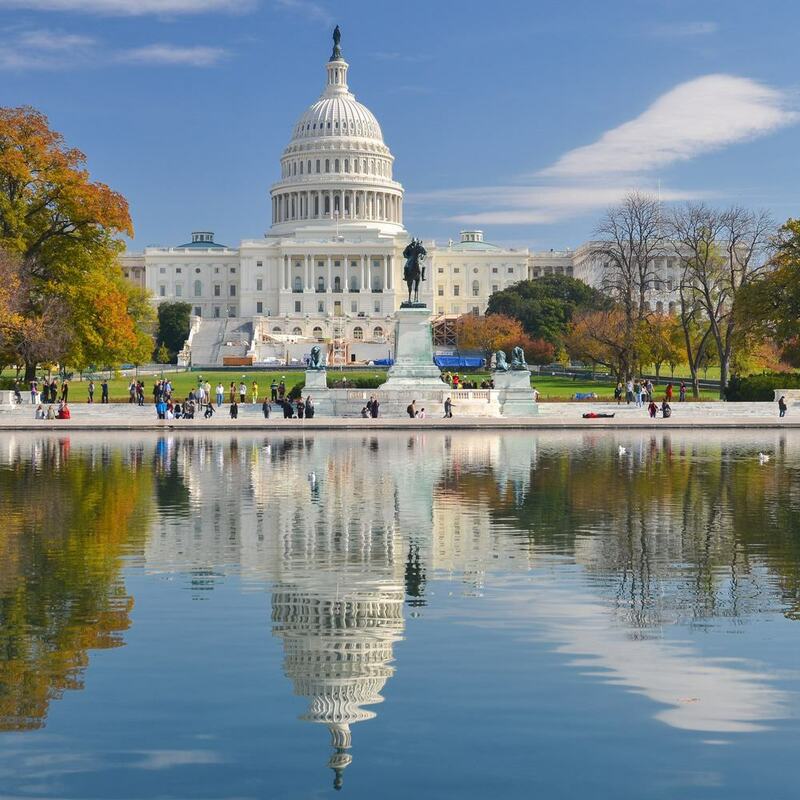 Essentially centered around the United States Capitol, popularly known as Capitol Building, the neighborhood is home to two of the three branches of U.S. government and the United States Congress. If you are here for a short visit, make the most out of visiting the important location in the neighborhood, starting with the Capitol Building and then moving on to the Supreme Court, the Library of Congress, the Statue of Freedom, so on and so forth. For something slightly light-hearted, visit Eastern Market, the biggest of its kind in the city and in operation since 1873. Union Station is also a good place for shopping and budget dining. Barrack Row, on the other hand, is a place for fine-dining and lots of bar-hopping. Other Highlights: U.S. Botanic Garden, Peace Monument, Ulysses S Grant Memorial, National Guard Museum, Congressional Cemetery, Robert Taft Memorial and Carillon, and James Garfield Monument. Hyatt Regency Washington on Capitol Hill – Located within close proximity of the White House and the International Spy Museum, the classy hotel features well-appointed guestrooms with the latest facilities such as iHome stereos, flat-screen TV with pay-per-view channels, safety deposit box, laptop safe, and spacious work area. Guests can also enjoy the on-site fitness center, an indoor pool, and dining facilities. Perfect for all kinds of luxury travelers. Capitol Skyline – Featuring an on-site restaurant, a business center, a seasonal outdoor pool, a lounge, and a poolside bar, Capitol Skyline offers newly renovated guestrooms with facilities such as comfy beds, free Wi-Fi, air-conditioning, safety deposit box, flat-screen TV with cable channels, and ensuite bathroom. A complimentary breakfast is served daily. Suitable for all kinds of travelers. Washington Court Hotel – Offering spectacular views of the Capitol Building (in selected rooms), Washington Court Hotel provides its guests with well-furnished guestrooms fitted with air-conditioning, flat-screen TV with cable, seating area, iPod dock, and ensuite bathroom with free toiletries. Guests can enjoy on-site dining, a 24-hour business center, and a fully-equipped fitness center. Great for all kinds of travelers.